Today evening I will be moving my blog to a self hosted one which eventually will break all the email notifications from my blog although RSS feeds will still continue to work. I wanted to thank all my subscribers of my blog who read my content. If you wish to continue receiving notifications via email you may want to resubscribe to my blog email notification once again. I will post back when the migration is complete. With release of SP2 a long awaited feature of Address List Segregation will now be available instead of using Exchange in Hosting Mode. A lot of other fixes are included in this release. One of our old days techies had this requirement of changing the From display name that is used by agents sending notifications about your mailbox size when it reaches the quota. Although you cannot edit the sender email address in this case you can indeed change the Display Name of this notification sender. CAUTION: Steps involved in this post include using ADSIEDIT, wrong modifications to attributes can cause service stoppage. You should also check Microsoft’s supportability for this change. 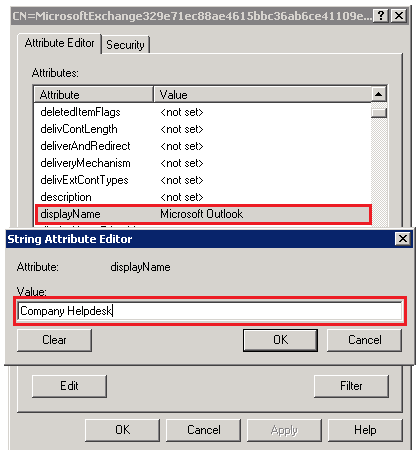 Changing this includes changing the display name of the object in your transport configuration. Right click on the object and select properties. Select displayName, click Edit button and enter the Display Name of your wish in the Edit Dialog box. That is all you need to do. Users will see the name that you entered in the dialog box after you modify this and the AD replication completes.